241 pages | 17 B/W Illus. When scientists formulate their theories, expectations, and hypotheses, they often use statements like: ``I expect mean A to be bigger than means B and C"; ``I expect that the relation between Y and both X1 and X2 is positive"; and ``I expect the relation between Y and X1 to be stronger than the relation between Y and X2". Stated otherwise, they formulate their expectations in terms of inequality constraints among the parameters in which they are interested, that is, they formulate Informative Hypotheses. There is currently a sound theoretical foundation for the evaluation of informative hypotheses using Bayes factors, p-values and the generalized order restricted information criterion. Furthermore, software that is often free is available to enable researchers to evaluate the informative hypotheses using their own data. 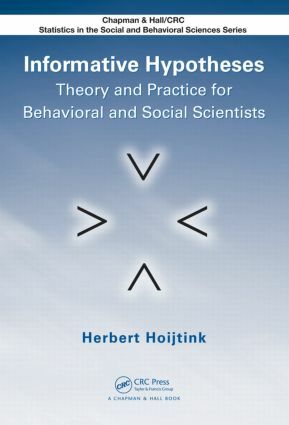 The road is open to challenge the dominance of the null hypothesis for contemporary research in behavioral, social, and other sciences. Density of the Data, Prior and Posterior . Appendix B: Derivation of the Bayes Factor and Prior Sensitivity . Constraints on Combinations of Means . Since 2003, Herbert Hoijtink has been Professor of Applied Bayesian Statistics at Utrecht University. He works in the Faculty of Social Sciences where he does research, teaches and provides statistical advice to behavioral (US spelling)and social scientists. In 2005, he received the prestigious VICI grant from the Netherlands Organisation for Scientific Research. This grant enabled him to establish a research group with the purpose to develop the statistical theory and corresponding software such that behavioral and social scientists will be able to evaluate informative hypotheses. The achievements of this group are presented in this book. Further information about the author can be found at http://tinyurl.com/hoijtink.